(3) Опубликовано: 26 февр. 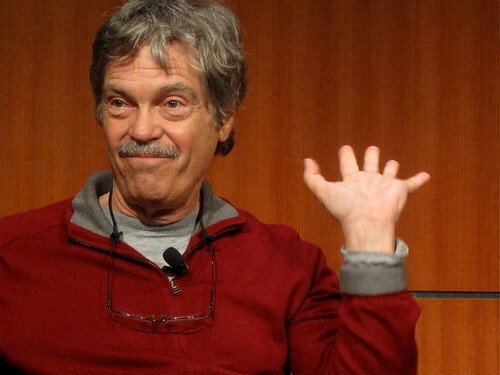 2015 г.
Alan Kay, is one of the earliest pioneers of object-oriented programming, personal computing, and graphical user interfaces. His contributions have been recognized with: the Charles Stark Draper Prize of the National Academy of Engineering "for the vision, conception, and development of the first practical networked personal computers" the Alan. M. Turing Award from the Association of Computing Machinery "for pioneering many of the ideas at the root of contemporary object-oriented programming languages, leading the team that developed Smalltalk, and for fundamental contributions to personal computing" the Kyoto Prize from the Inamori Foundation "for creation of the concept of modern personal computing and contribution to its realization." This work was done in the rich context of ARPA and Xerox PARC with many talented colleagues. At the Xerox Palo Alto Research Center in the Early 70's he invented Smalltalk, the first completely object-oriented programming, authoring and operating system (which included the now ubiquitous overlapping window interface), instigated the bit-map screen, screen painting and animation, participated in developing desk-top publishing, other desk-top media, and the development of the Alto1, the first modern networked personal computer. This was part of the larger process at PARC that created an entire genre of personal computing including: the GUI, Ethernet, Laserprinting, modern word processing, client-servers and peer-peer networking. He has a BA in Mathematics and Biology, with minor concentrations in English and Anthropology from the University of Colorado, 1966. MS and PhD degrees in Computer Science (1968 and 1969, both with distinction) from the University of Utah, and Honorary Doctorates from the Kungl Tekniska Hoegskolan in Stockholm, Sweden, Columbia College in Chicago, Georgia Tech, the University of Pisa in Italy, the University of Waterloo in Ontario, Canada, and the University of Murcia, in Murcia, Spain. He has been elected a Fellow of the American Academy of Arts and Sciences, the National Academy of Engineering, the American Association for the Advancement of Science, the Royal Society of Arts, the Association for Computing Machinery, and the Computer History Museum. Other honors include: J-D Warnier Prix d'Informatique, ACM Systems Software Award5, NEC Computers & Communication Foundation Prize, Funai Foundation Prize, Lewis Branscomb Technology Award, the ACM SIGCSE Award for Outstanding Contributions to Computer Science Education, and the CRN Hall of Fame. He has been a Xerox Fellow, Chief Scientist of Atari, Apple Fellow, Disney Fellow, and HP Senior Fellow. He is currently an Adjunct Professor of Computer Science at UCLA. In 2001 he founded and is president of Viewpoints Research Institute, a non-profit organization dedicated to children, learning and advanced systems research. At Viewpoints Research Institute he and his colleagues continue to explore advanced systems and programming design by aiming for a "Moore's Law" advance in software creation of many orders of magnitude. Kay and Viewpoints are also deeply involved in the One Laptop Per Child initiative that seeks to create a Dynabook-like "$100 laptop" for every child in the world (especially in the 3rd world). Outside of computing, Kay entered show business in the 50s as a professional jazz guitarist. Much of his subsequent work combined music and theatrical production. Today he is an avid amateur classical pipe organist and has just taken up jazz guitar again after more than 40 years.